The main goal of utilizing stem cells is to deliver optimal cellular therapies to patients. It is essential that the stem cell provider pays particular attention to the number of cells isolated, as well as the viability of these cells. The ability to count nucleated cells and their viabilities is a necessity to verify the potency of what the stem cell provider is delivering back into the patient, yet is not consistency done by all stem cell providers. Proper stem cell harvesting and isolating techniques are necessary to ensure that the cells are viable and ample, as potential Mesenchymal stem cells (MSCs). We outline below both the rationale and the techniques we employ in order to deliver optimal orthobiologic therapies. It is important to take into account the patient’s age and the intended stem cell applications when determining how much bone marrow needs to be aspirated. In order to make sure that mononuclear cells with good potential are harvested, bone marrow is drawn from several different pockets in the pelvis. Shown in Fig. 1 below is a Wright’s stain of a bone marrow aspirate peripheral smear 100mL in size taken from the posterior iliac bone and several different pockets in the pelvis. This bone marrow aspirate was passed through a 200-micron filter to eliminate any small bone fragments or clots in order to avoid injecting these back into the patient. Fig 1. Bone Marrow Aspirate (Wright’s stain) from 50 year-old patient. Purple cells are nucleated cells. We are particularly interested in nucleated cells with round nuclei (mononuclear cells). Typically, a hybrid bone marrow stem cell therapy protocol is used. In this protocol, a small amount of the filtered bone marrow aspirate is set aside and not processed, but the majority of the total bone marrow aspirate is centrifuged to concentrate the nucleated cells with stemness potential. Stem cells numbers are important, but we might be discarding important healing agents like pluripotent Muse cells and very small embryonic-like stem cells (VSELs), that have even greater potential for healing than MSCs. Historically, for the bone marrow concentration technique, most of the emphasis was put on increasing the density of nucleated cells. Many of the techniques employed by stem cell providers and bedside kits use centrifuge RPMs and g-forces that are extremely high. In our testing, we found that these excessively high forces come at a steep price in terms of the end result for the viability of the cells that are isolated. This has led us to employ a much safer approach to our cellular isolation techniques. We see below in Fig 2., a Wright’s stained peripheral smear of our bone marrow concentrate after centrifugation with a higher density of nucleated cells. Fig 2. Bone Marrow Aspirate Concentrate (Wright’s stain) from same 50 year-old patient from above. There is a much higher density of purple stained cells that represents increased nucleated cells - in particular, the mononuclear cells. In the lab, we will employ flow-cytometry to calculate accurate cell counts and viabilities. Flow-cytometry uses lasers to scatter light off of cells as a way to count and characterize them. In order to count the number of nucleated cells in our bone marrow aspirate and concentrates, we take a small amount of the bone marrow sample, dilute it in a buffered solution, then add a lytic reagent that lyses all of the cell membranes in the sample. We are then able to count the number of nuclei that are in the sample to obtain accurate nucleated cell counts. Fig. 3 BMA Flow Cytometry Histogram using sample from our patient’s filtered bone marrow aspirate. For our initial filtered bone marrow aspirate histogram seen above in Fig. 3, we will “gate” between 4.5 and 10 microns to count our nuclei. We see our count is 2.81e+05 cells/mL and using a conversion factor of 128 (calculated above), we can arrive at a total nucleated cell count for our 100mL bone marrow aspirate. In the total sample there are approximately 3.6 billion nucleated cells. Our goal is to next concentrate 90mL of this sample, with an emphasis on gathering mononuclear cells, since these are the cells that have stemness potential. The sample is centrifuged using moderate g-forces to ensure excellent cell viability in order to yield 16mL BMAC. We proceed to analyse this with flow cytometry, using a similar calculation to above (Fig. 4 below) and using similar gating cutoffs for size. Fig. 4 BMAC Flow Cytometry Histogram using sample from our patient’s filtered bone marrow aspirate concentrate. Our BMAC sample contains approximately 2.4 billion nucleated cells. We have purposely selected mononuclear cells over granulocytes by way of our bone marrow aspirate fractionation method. The final step is to verify that the cell yields are healthy and viable. Cell viability is tested using a reagent that rapidly enters damaged cells by way of their more permeable cell membranes and attaches to the cell’s DNA. 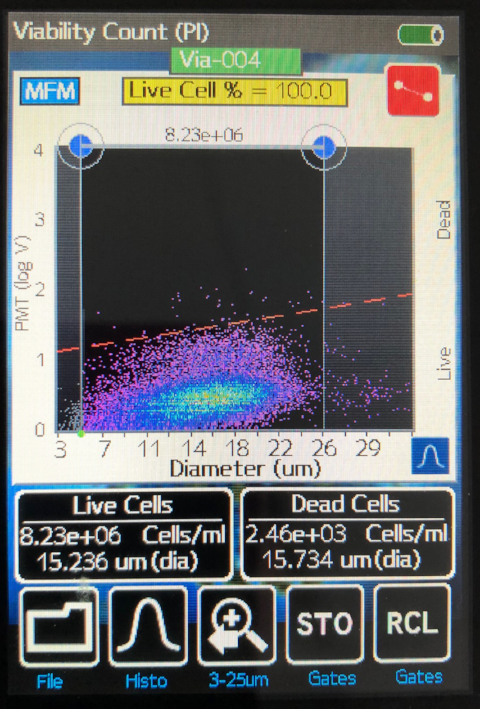 The flow cytometer will recognize the damaged cells that the reagent enters, and these cells will fluoresce higher along the y-axis of the output. We gait our sample below, along a slightly positive-sloped dashed red line, in order to delineate between our healthy and unhealthy cells. It is easy to see that our protocols have excellent viability yields. Only 1 cell in 3,345 is non-viable; otherwise stated, we have 99.97% viability for our sample. Fig. 5 BMAC Flow Cytometry Viability using sample from our patient’s filtered bone marrow aspirate concentrate. Note, sample diluted 10x with buffered solution. From the case above, it is clear that the work necessary to provide stem therapy is both highly complex and critical to success of the procedure.